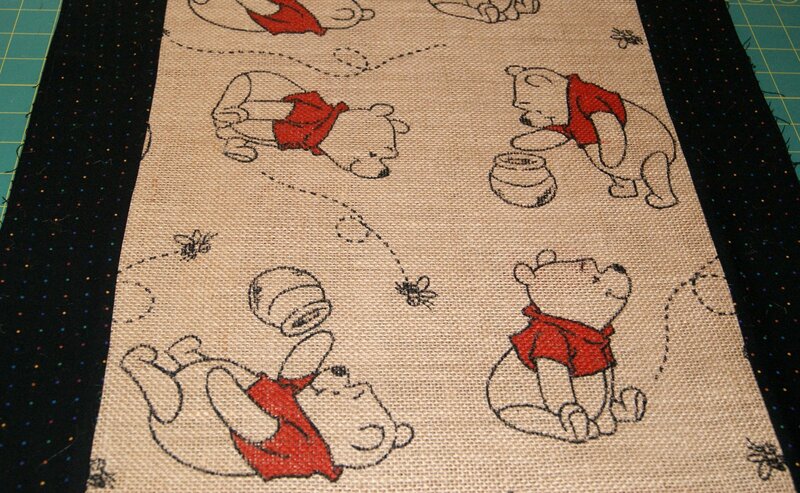 I found a remnant of burlap fabric with inked pictures of Winnie the Pooh on it and thought “Oh how cute!” bought it and got it home and then thought “What was I going to do with it?” It was only about 13 1/2 inches wide but a nice long length of about 50 inches. Now that the Christmas holidays have past, I again looked at that remnant and imagined a very nice large toy tote bag, PERFECT! So here are my directions for sewing the tote bag. What I needed to do first was make the burlap fabric wide enough so I added a 3 inch wide strip of black cotton fabric from my stash to each side of the burlap. I only sewed a 1/4 inch seam allowance because I wanted a maximum width of about 17 or 18 inches. 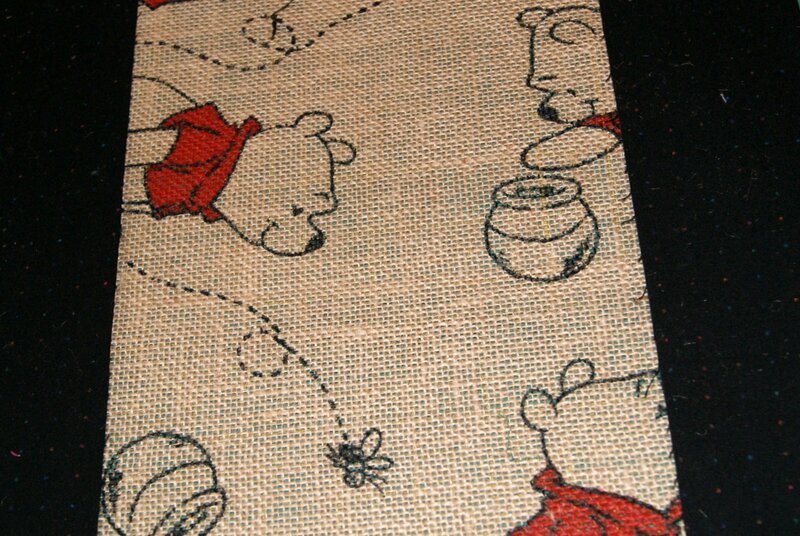 After stitching on both strips, I then serged them and pressed the seam towards the black fabric. 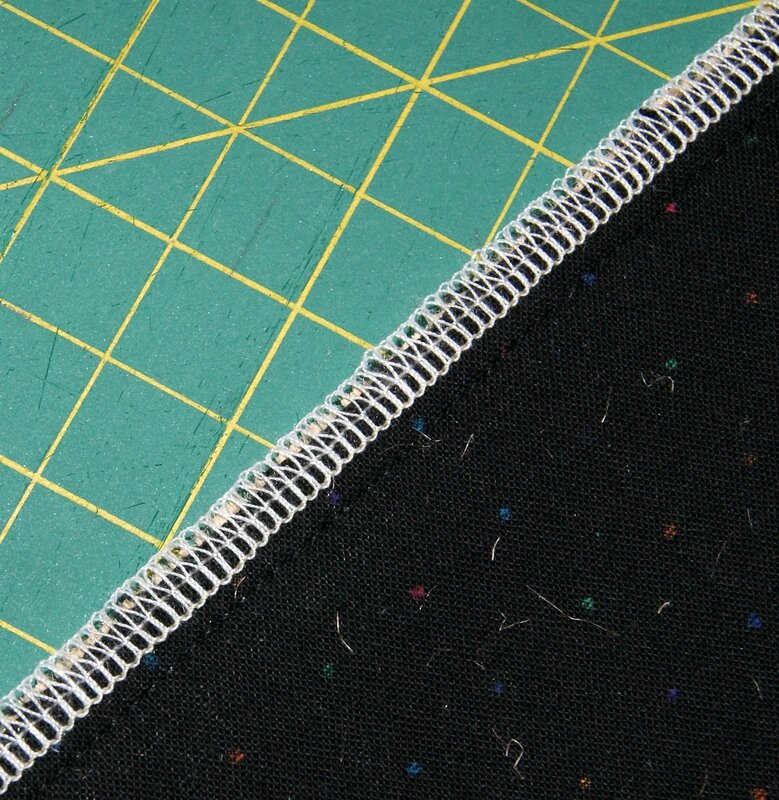 Next I sewed a decorative fagoting stitch as a top stitch to keep that seam permanently in place. 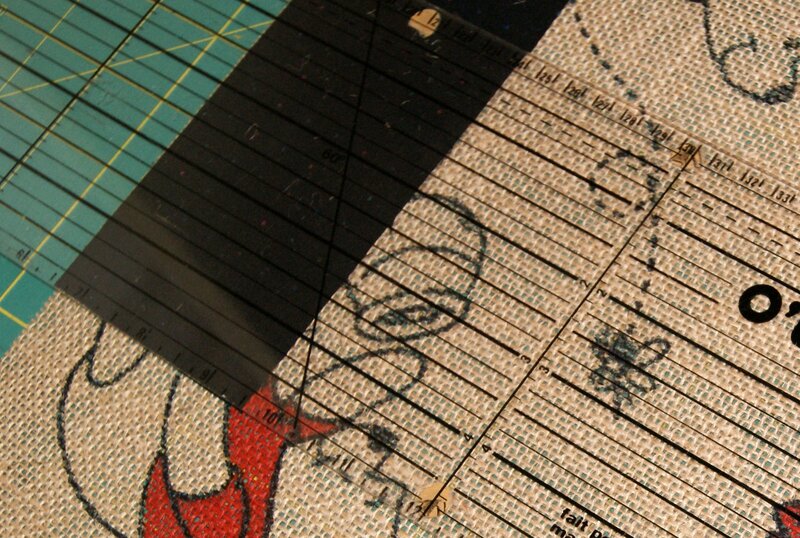 Now my finished piece of fabric is approximately 19″ wide by 45″ long. Sorry, lots of shedding from the burlap!! Now I took that piece of fabric and laid it on top of another cotton fabric (right sides together) that I used as my guide to cut out a lining for the tote – so now I have 2 pieces of fabric 19″ wide x 45″ long. Next I made the straps, using the same black cotton fabric for them. 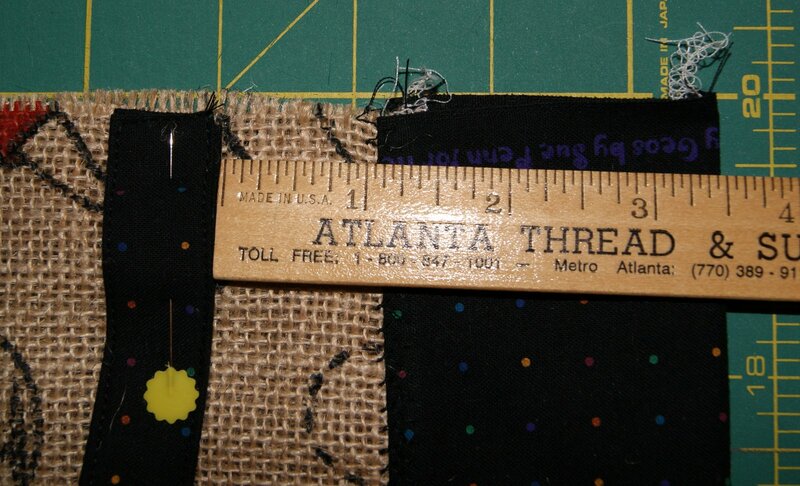 I cut my straps 3 inches wide by 21 inches long. I folded the straps in half (wrong sides together) and pressed with the iron. 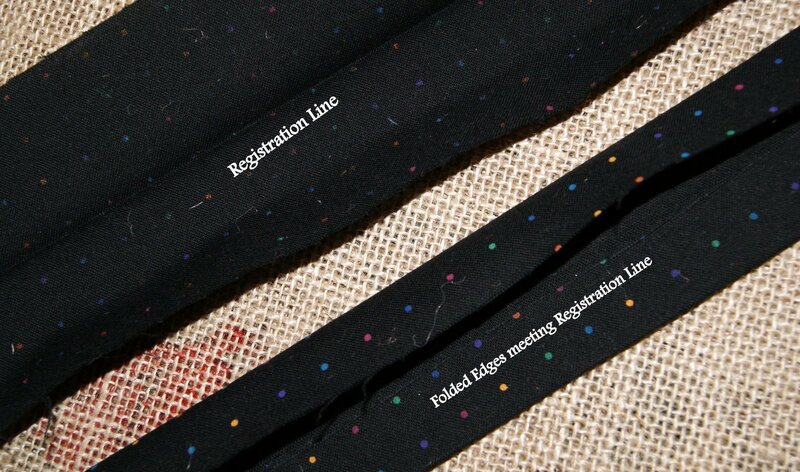 This is for a registration/reference line. Open up your strap and with wrong sides facing you, fold each side in to the pressed line. Iron in place, then fold so that your two non-raw side edges meet and press again. Sew close to the edge, turn and stitch along the narrow edge, turn and stitch close to the opposite edge to create a nice top stitching effect for your strap. 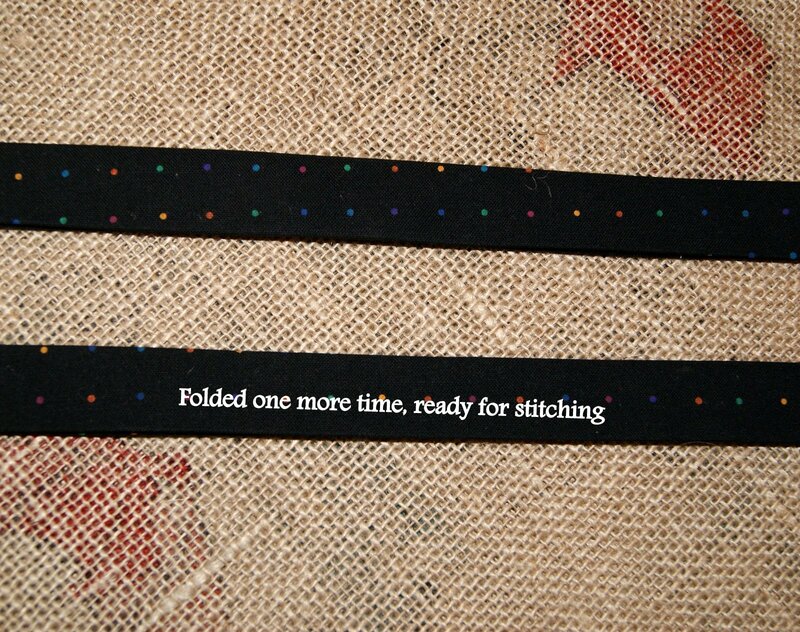 Now your straps are ready to be sewn onto your main fabric tote. Strap placement is a personal option but you want to make sure they will provide good balance and support for whatever you put inside your tote. 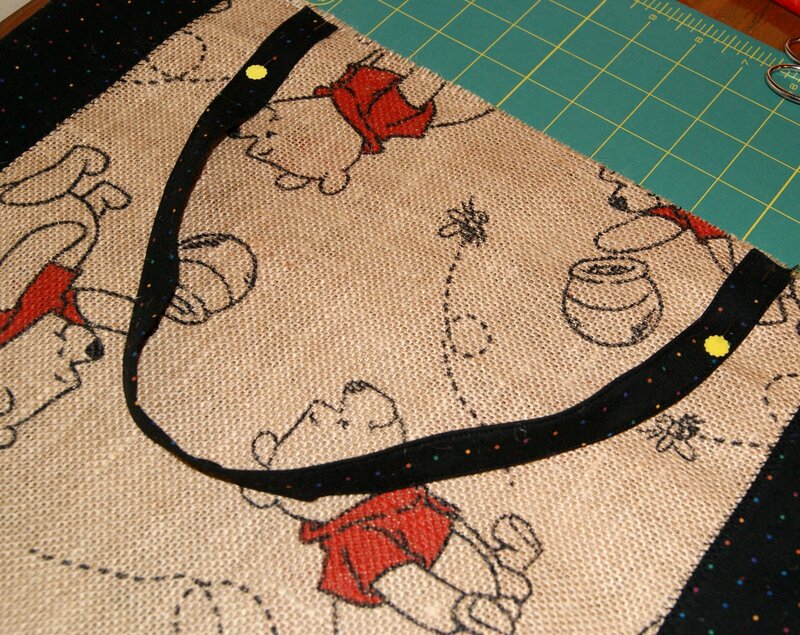 For this toy tote, I placed my straps 3 1/2 inches in from the side seam on the right side of the main fabric. 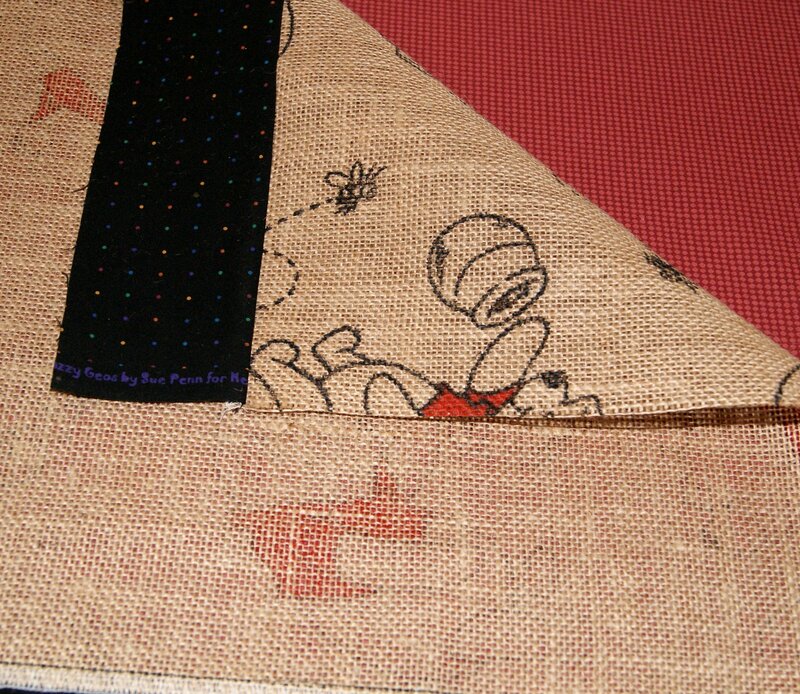 Do a baste stitch to hold the straps in place. Make 2 straps and attach at each end of your long fabric piece. 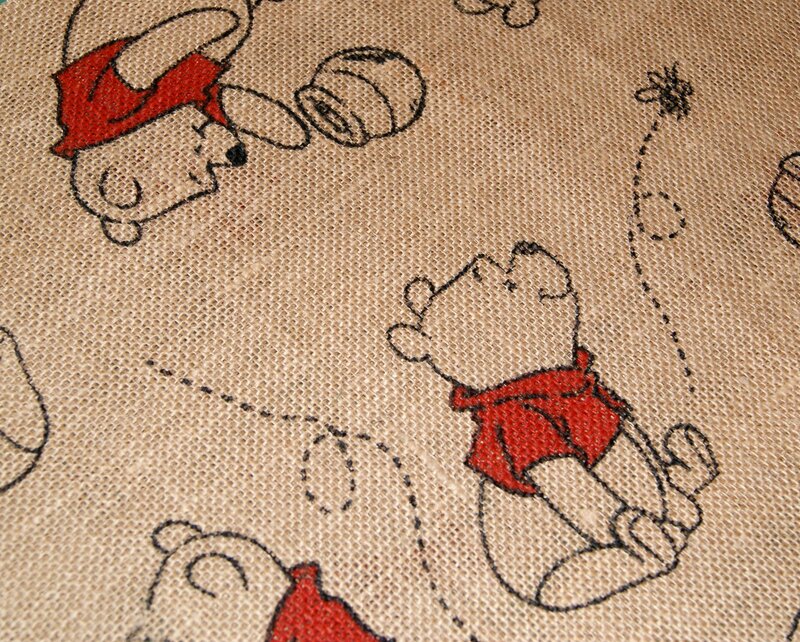 Continue by going to Sewing a Tote Bag PART TWO blog. I know this is a long post but wanted to describe thoroughly.